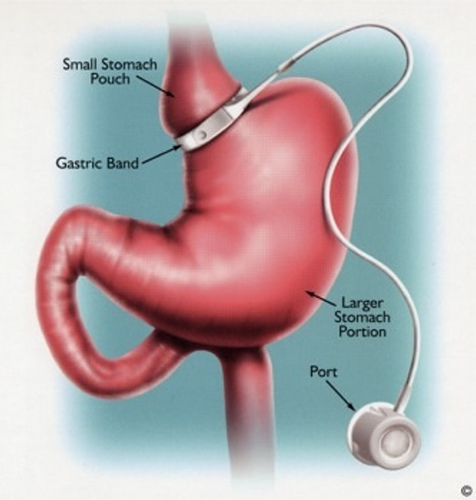 Laparoscopic gastric banding, known as lap band surgery, helps with weight loss. The surgeon places a lap band around the upper part of your stomach to create a small pouch to hold food. The lap band limits the amount of food you can eat by making you feel full after eating small amounts of food. The lap band is connected to a port or container which is placed below the skin of your belly. After surgery, your surgeon can insert a needle to reach the port and add or subtract saltwater to it, which in turn causes the lap band to tighten or loosen on your stomatch. Lap band surgery may be a good solution if you are 100 pounds or more overweight or have a body mass index of 40 or more. To know for sure if you are candidate for lap band surgery, you'll need to be evaluated by one of our surgeons. General anesthesia is used so you are asleep and cannot feel pain. Lapaoscopy is used to place a TV camera through a small incision in your belly, so the surgeon can see your organs. A few more small incisions are made so the surgeon can insert his surgical instruments. The surgeon places a lap band around your upper stomach to separate it from your lower stomach. The lap band creates a small pouch in front of the lower part of your stomach. Your stomach is not cut or stapled, it is only secured with the lap band. The surgery will take 30-60 minutes. Stop taking drugs that slow down blood clotting like aspirin, ibuprofen, and vitamin E.
After lap band surgery, whenever you eat you will feel full with less food because the small pouch in your upper stomach that is created by the lap band will fill up. A day after the surgery is when most patients can go home. You can begin a normal lifestyle in another day or two. This may be enough for many patients. 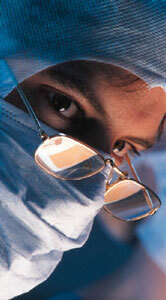 Talk with your doctor about which procedure is best for you. After lap band surgery, patients on average loose a third to half of their extra weight. Weight is lost for up to three years following lap band surgery.